Is there somewhere in this wiki a missing pages page? I am asking, because I badly miss the opensuse package conventions. I know that there is the wiki mailing list, but I am not subscribed there. I also do not have time to currently read through a wiki styleguide to do the needed changes myself. IMHO best would be to add a page with wanted articles, maybe also set a link to where it could be found on en-old that would be resolved over time. I just see that the layout of search results has changed. It is quite annoying I have to scroll down to see the first search result. My first impression was that there are no search results at all. 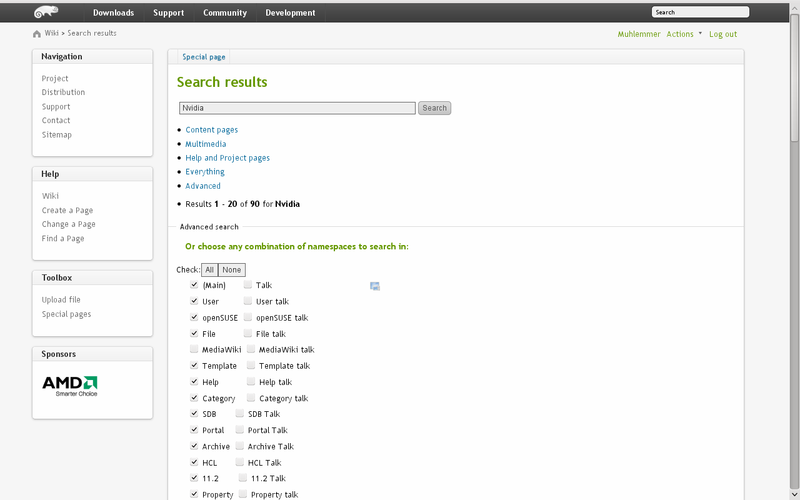 In the old situation the additional search options are below the results, now they are on top. Can we go back to the old layout? This page was last modified on 1 July 2016, at 21:28. This page has been accessed 532,758 times.